So, you’ve hit the big 60? So what?! Your life is now your own and you can set your fitness free. Time is no longer such an issue, nor is the necessity to wear snazzy hot pants or Lycra micro tops. Embrace your body and your fitness! This is the name of the study which showed engaging in regular exercise at the recommended level for your age reduces the risk of breast cancer by as much as 25 per cent, bowel cancer by as much as 45 per cent and the risk of developing dementia by as much as 30 per cent. It also revealed that regular exercise can reduce the risk of ever having a stroke by 30 per cent! 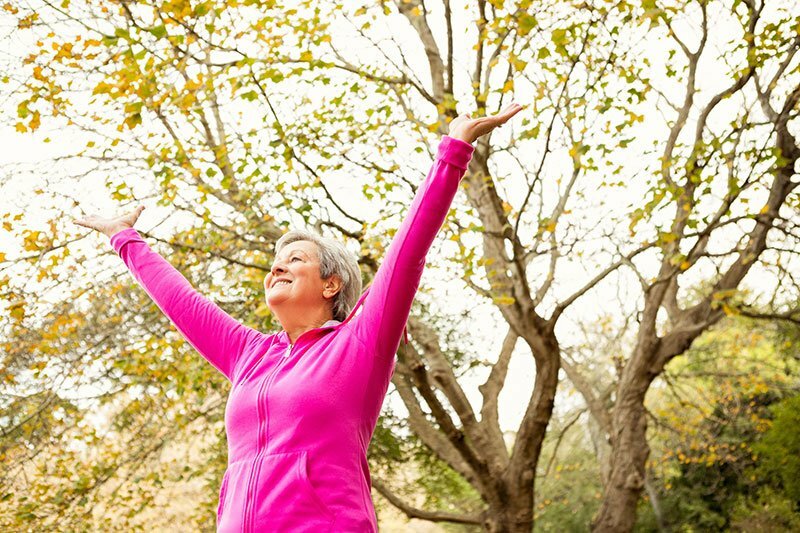 When considering just how common these types of conditions are in people over 60, the benefits of exercise are astonishing. What types of exercise are best for over 60s? The simple answer is – pretty much everything! Any kind of exercise is beneficial. We would suggest finding something that you really enjoy, that way it won’t feel like a chore. Something a little way outside of your comfort zone will maximise your energy output and will help build resilience. Will exercise put strain on the heart? No. As your fitness increases, your heart rate will most likely become slower and you will be able to take part in more intense exercise without becoming overly breathless or tired. Eventually, your blood pressure will decrease as well. By working your heart that little bit harder and stretching its capacity, your cardiovascular fitness will improve. Start light and build gradually. Walking at a leisurely pace is a great place to begin, it will stretch and activate your muscles – mostly lower body – but this is the perfect foundation. However, continuing to walk at a comfortable/easy pace won’t improve your stamina. You can build it simply by increasing your speed. You will become more breathless the more you push yourself, but it will pay off. You will soon be able to sustain prolonged periods of physical and mental effort. Sign up to LUXe Bootcamp! It may sound daunting, but we offer a fantastic workout for all levels. Our Bootcamps help you understand your body while surrounding you with like-minded people. You will have a unique opportunity to meet new people and improve your fitness in an encouraging and refreshing environment, regardless of your age or fitness level. For more details, click here. Aside from all of the clear physical benefits, the endorphins released during exercise help to keep you feeling positive. As we get older, it’s easy to fall into mainly sedentary routines and this can easy lead to a dip on your mood. Staying fit will keep both your heart and your soul happy!